It’s Tuesday, November 27, 2018, and National Bavarian Cream Pie Day, but when was the last time any of us had that treat? In the UK, it’s Lancashire Day. Stand tall, Yonners! As my driver’s license expires on my birthday this year—in about a month—I’m heading downtown today to renew it, which means taking only the eye test. I have spiffy new glasses. so it shouldn’t be a problem. But posting may be light today because, once downtown, I may have a bit of culinary fun. [Del Mundo] humorously relates that when she arrived in Boston and went to the dormitory assigned her in a letter from the director of the hospital housing, much to her surprise she found herself in a men’s dorm. Unknowingly the Harvard officials had admitted a female to their all-male student body. But because her record was so strong the head of the pediatrics department saw no reason not to accept her. Thus, upsetting Harvard tradition, she became the first Philippine woman and the only female at the time to be enrolled at Harvard Medical School. She returned to practice in the Philippines, established a pediatric hospital, and went on to a distinguished career as a doctor and as a scientist studying infectious diseases, garnering copious honors along the way. On November 27, 1971, the first man-made object to reach Mars reached Mars. Sadly, it was a Soviet module whose descent system malfunctioned, and the module crashed on the surface. Finally, it was on this day in 1978 that Dan White assassinated San Francisco mayor George Moscone and Harvey Milk, the first openly gay city supervisor. White served five years of his 7-year-sentence (his sentence was reduced because of his mental problems), and then killed himself two years after release. Notables born on this day include Anders Celsius (1701), Chaim Weizmann (1874), Lars Onsager (1903), Buffalo Bob Smith (1917), Gail Sheehy (1937), Bruce Lee (1940), Jimi Hendri (1942), Kathryn Bigelow (1951), Steve Bannon (1953), Bill Nye (1955), and Caroline Kennedy (1957). Those who died on November 27 include Ada Lovelace (1852), Baby Face Nelson (1934), Eugene O’Neill (1953), and Harvey Milk and George Moscone (1978; see above). Hili: And we got what was coming! 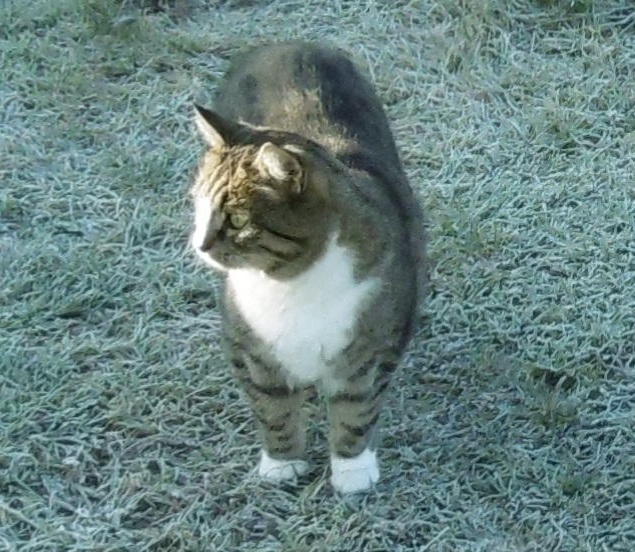 Hili: The fact that my paws are freezing again. Hili: No i doczekaliśmy się! Hili: Tego, że mi znowu łapki marzną. This is so plaintive and sad. Poor kitty! Tweets from Matthew. First is a wonderful duck + duckling rescue by a nice man. Put the sound up to hear the quacks and peeps. This entry was written by whyevolutionistrue and posted on November 27, 2018 at 6:30 am and filed under Hili Dialogue. Bookmark the permalink. Follow any comments here with the RSS feed for this post. Both comments and trackbacks are currently closed. A good duck story to start the day. Hili needs some shoes. The driver’s license – maybe the cheapest part of auto ownership. That 4WD that rolls off down the hill – that happens quite often when righting vehicles, if the Fail videos on Youtube are anything to go by. Either it carries on and goes right over, or it lands on its wheels and then sets off merrily down the slope because no-one checked that the parking brake was on. These people have a deficit in their “intuitive physics” module. I think you missed the ‘x’ on the end of Jimi Hendrix. Slightly unusual for you not to have a link to one of his songs as well. I will go listen to one. I don’t get the rope post. Tweet pix are often cropped. You have to click on it to see the whole picture. So is this your 18,000 post? Congrats! That duck rescuer is wonderful. Without wanting to sound pessimistic, but spiffy new glasses themselves will not guarantee good results in a driving test. Glaucoma (the thief in the night) may affect one’s visual field, early cataracts can change your refraction in a very short time, optic neuritis can -already in early stages-severely affect colour vision. There is a lot of other common pathology that will not be helped by glasses. The widespread belief, well not belief, but rather assumption, that glasses cure eye conditions’ may cause quite some disappointment. (Sorry if sounding stuffy, but about the most frequently heard question in an ophthalmologist’s practice is: “but dr, can you not just prescribe some specs?”). Good thing he’s probably reading this AFTER he’s passed his eye test. While we like to mock our Western neighbors – and they like to return the favor – I suspect that would be “the Swedish-Norwegian Club in Paris”.